The SAT is one of the most well-known tests in existence. In the United States, it’s the standardized test for college admissions. Since it was introduced in 1926, the scoring and other aspects of the test have been changed multiple times. Currently, the SAT is both published and owned by the College Board, which is a nonprofit organization. Today’s SAT requires an average of four hours to complete, and the score can range from 600 to 2400. A lot of people don’t realize the importance of proper studying for this test. An SAT study guide can make a huge difference in the results that you get on the test, and below, you’ll find our list of the top 10 SAT study guides. The first guide is from Langley Thomas, and it’s available as a Kindle book. Langley Thomas is 17 years old, and he lives in Mount Pleasant. As a junior at Charleston Porter-Gaud School, he has been awarded the Malone Scholarship for gifted students. The purpose of this guide is to simplify the SAT study process because the process can be confusing for many individuals. This guide for the Kindle makes study preparation for the SAT quick and easy and delivers some of the top study material for high school students. It recommends top study guides and costs thousands of dollars less than other SAT prep courses. According to the author, you’ll get the results you wish to achieve if you use this guide and study hard. If you’re looking for an official guide, you should consider this product. It’s from The College Board and includes official SAT practice tests and study material. Since these study guides come straight from the test maker, they’re some of the best materials that you can get for the SAT. Although the four major practice tests are available on the official website, this guide gives you the practice tests in print, which makes them more realistic. The guide also comes with 300 pages of additional instructions, test information and guidance. Since a new SAT test will be launched in 2016, it’s important for students to have the latest study material, which is exactly what this guide has to offer. It gives students four practice tests, detailed math descriptions, targeted practice questions and more. This is another top SAT study guide, and it’s from the organization that actually makes the test, so the information inside of it has to be good. An excellent benefit from this guide is the fact that it comes with a DVD, which makes the study materials easier to understand. 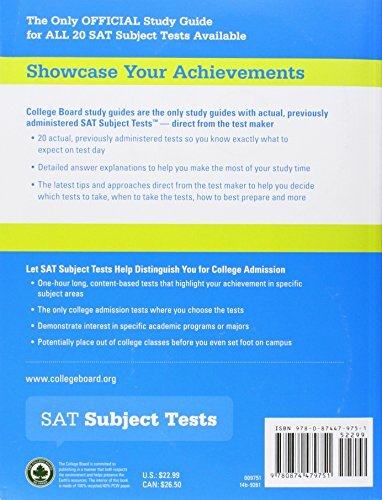 The book has over 1,000 pages and provides everything that is needed to study for the SAT. The companion DVD is great for students who have difficulty consuming study material in the form of text. This new guide comes with an additional bonus practice test and timer. The DVD has a math concepts review video and helps students better comprehend the material. The book contains 10 official SAT practice tests and offers exclusive access to online explanations for answers to the test questions. You even get free online score reports. This guide comes from Princeton Review, and it’s another Kindle book. It contains six full-length practice tests, which have been specifically created for the latest SAT exam. It comes with updated scoring strategies and much more. This particular guide has been made for on-screen viewing and includes explanations, answers and cross-linked questions. Since big changes are going to be made to the 2016 version of the SAT exam, it’s important to have an updated guide. 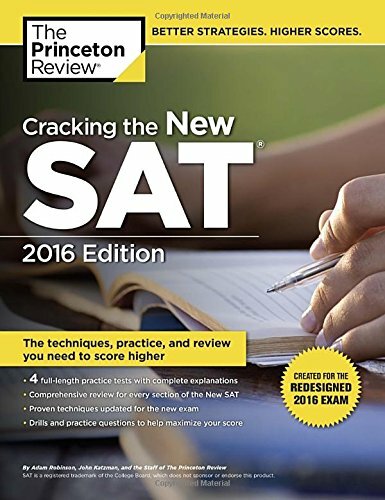 The good news is that this guide is made for the 2016 version, and it provides powerful tactics that help you to beat the latest SAT and avoid traps. It offers important tips that help you guess logically and pace yourself. It even contains strategies that are essential to helping you work smarter and not harder. 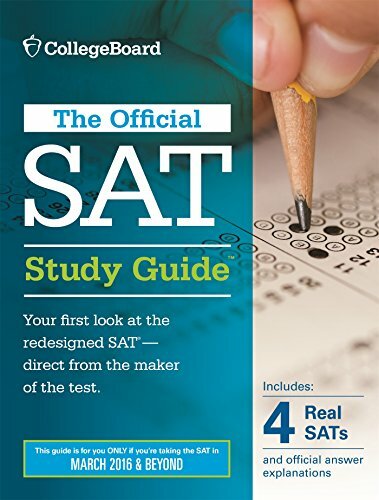 If you’re looking for the second edition of the official SAT study guide, then this product could be for you. Although it’s the not the latest release, it still contains very useful information. With over 1,000 pages of content, it delivers all of the material that you need to properly study for the SAT. By purchasing and using this guide, you should gain valuable experience and feel much more confident while taking the test. It helps you review critical concepts and offers a number of different practice questions, which are very similar to the questions that you’ll have to answer on the real test. The second edition of the SAT study guide includes three of the newest exams and practice tests. You even get online score reports. Although it’s somewhat old, this guide still gives you all of the information that you need to beat the test. Here is another guide from the official organization that creates the SAT test. Since it’s an official SAT study guide, it contains all of the information that you need to study. However, this particular guide has more to offer than other official guides. It gives you 20 previous tests, which were used for all 20 of the subject tests. There are even exclusive answer explanations that come straight from the official makers of the test. To help you know what to expect on the day of the test, this guide comes with the newest background-questions and answer-sheet. It offers the latest, up-to-date tips and information, so you can approach the test the way it’s meant to be taken. You even get two audio CDs and listening tests. There are detailed descriptions for every single subject in the real test, so there is no topic that isn’t covered. If you’re looking for quality study material, this is one of the best SAT study guides that money can buy. If you’re looking for a paperback guide, you should consider this guide. The Kaplan SAT Strategies Guide is made for the latest SAT tests. It contains study material for the 2015 and 2016 SAT, so you’ll be prepared for the 2016 test. 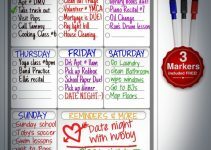 With all of the essential tools for study, this guide is effective and affordable. While some courses cost thousands of dollars, you can get this guide for a fraction of the cost. It delivers many practice questions, and when you answer the questions wrong, it gives you detailed answer explanations. The newest version of the SAT will be released in March, so if you want to be adequately prepared to pass it, you’ll want to consider this guide. It’s one of the best study guides for students who’re looking to score higher on their SAT test. With five realistic practice tests, you’ll have plenty of opportunities to test your study skills. There are even expert strategies and insider tips. This is the non-premium version of the SAT study guide from Princeton Review. However, it still contains a wealth of study material. Since this guide is designed for the newest versions of the SAT test, you can rest assured that it will prepare you to score higher. According to prominent sources, the latest SAT test will be longer and contain tougher questions. This guide contains tips that help you to guess logically and offers powerful tactics for avoiding the traps set within the newest SAT tests. The strategies in this book will help you to work smarter. You get hands-on exposure to the newest four-choice questions and valuable practice. To further increase your comprehension, there are reading comprehension passages and multi-step problems. 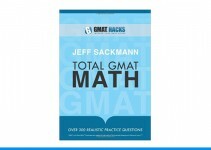 Here is a great paperback guide for the math section of the SAT test. It contains all of the information that you need to score a perfect score on the math portion of the test. Some students agree that the SAT Math 2 Subject Test is the hardest part of the entire test. This guide gives you two full practice tests, detailed information on key topics and targeted strategies. In this guide, there are proven strategies that work and plenty of tips to help you logically guess the answer to troublesome questions. As is the case with all of these study guides, there are tips to help you study smarter. 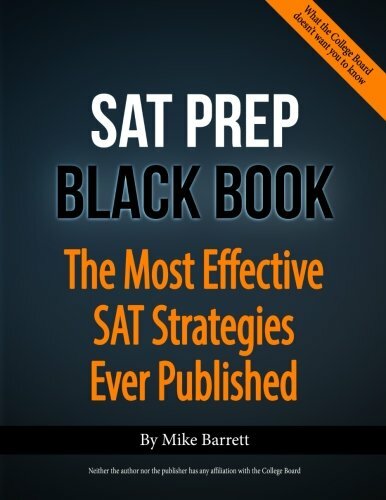 Another top guide is the SAT Prep Black Book. It boasts the best SAT strategies ever published, and it actually makes good on this promise. You can get the paperback version, and it contains the best strategies from Mike Barrett, who is an SAT tutor. With the study material contained within this book, you have a much better chance of scoring a perfect 2400. If you want to be competitive, you’ll need to shoot for a perfect score, and you can get all of the study material that you need from this book.